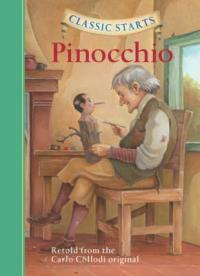 The adventures and misadventures of Pinocchio, a living wooden doll made by the old carpenter Geppetto. Pinocchio is a capricious and insolent boy, and will have to learn to live from his own mistakes: whenever he says a lie, his nose will grow as a punishment. However he will always have the help and advice of the Cricket and the Fairy, and the father is always waiting for him. A classic of children's literature.